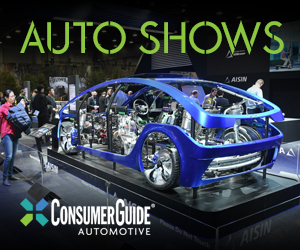 When Consumer Guide® editors tried out the 2017 version of the Mercedes-Benz CLA-Class 4-door “coupe,” they got the full force of everything that’s new to the car. Extra-cost LED headlights and hands-free trunk access? Done and done. The $2400 Sport Package adds 18-inch AMG alloy wheels, upgraded brakes, and unique body styling. Outside of that, this premium compact sedan is still generally staying within the lines—stylistically and otherwise—laid down in its 2014 debut. Back then, you might recall, the CLA was advertised as the car that was going to spare earnest strivers from making Faustian bargains by being an M-B with a starting price less than $30,000. Those days and that price are gone—a front-wheel-drive CLA250 now costs $32,400 before options and delivery. It takes another 2 grand to step up to the all-wheel-drive CLA250 4MATIC that CG tested, and it ballooned to $50,250 delivered with a raft of extras. With no fundamental changes to its packaging, the “budget” Benz carries on with whatever strengths or weaknesses that it has always had. It suffers in rear-seat room and comfort—which makes it feel a lot like the coupe it wishes it could be. Unless front passengers can make themselves comfortable sitting far forward, rear legroom is limited. Plus the drooping roofline that looks good from the outside doesn’t leave all that much headroom for those sitting inside. Entry and exit requires bobbing and weaving to clear the low opening. The rear seat cushions are fairly upright and firm (probably not the best for whiling away the hours of a long trip), and a tall driveline tunnel rules out comfortable three-abreast seating. The CLA cabin is nicely appointed, at least when outfitted with the available Black Ash Matte Trim ($250) and Interior Package ($1650), which adds leather seating surfaces, M-B Tex upholstery on the dash and doors, and ambient lighting. Front-row passenger space is acceptable, though door openings are small. Second-row space is cramped for most adults. On the other hand, luggage or groceries might not mind riding in the CLA so much. The trunk opening narrows considerably at the bottom, which will complicate loading, but the space on the flat, wide floor is quite good for a car of this size. There’s a large net pouch on the left side, and a lot of small-item storage in an organizer under the floor. Gooseneck hinges are covered to prevent their possibly damaging goods carried in the trunk. Levers release the rear seats, split in 60/40 fashion, to open further cargo space. The seats fold flat, but they align with a “step” at the front of the trunk floor that must be negotiated when loading long items. 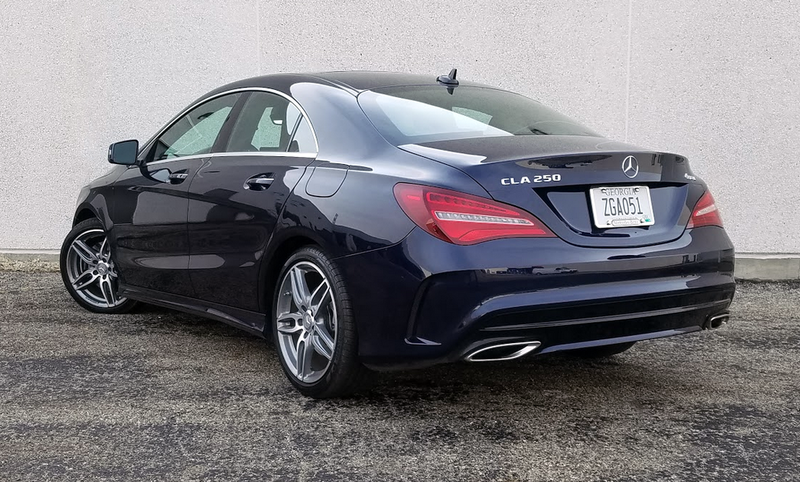 This reviewer wouldn’t call himself a fan of the CLA’s ride on the 18-inch AMG alloy wheels included in the $2400 Sport Package. Bumps and road cracks often overcame what passed for damping and jolted the cabin—sometimes a little noisily. Worse yet, this was with the optional adjustable suspension in the “Comfort” setting. Steering and handling were better, though, with nice body control in quick lane changes and curling up expressway ramps. Braking was excellent. An opening that narrows toward the bottom compromises access to the CLA’s trunk, which is otherwise usefully large. Along with the base model’s front-wheel drive, CLA also moved away from Mercedes-Benz traditions with a turbocharged 4-cylinder engine. The 2.0-liter powerplant in the CLA250s makes 208 horsepower and 258 lb-ft of torque, enough for good standing-start getaways and easy open-road cruising. The engine is teamed with a 7-speed dual-clutch automatic transmission that upshifts smoothly. The standard fuel-saving stop/start (which can be switched off) is a little rough when reengaging. This driver covered 161 miles in the test car, 60 percent of that in city-type driving, and saw 25.1 mpg. That’s not quite up to the EPA combined-mileage estimate of 27 mpg, but outdoes the projected city mark of 23 mpg. A console-mounted control dial governs audio and other displays that appear on the larger, slimmer 8-inch display screen that unfortunately looks like it was screwed to the edge of the dash as if somebody forgot to plan to build it in. Inputting audio settings or otherwise working through the views takes a decent amount of operator attention, and if that operator is the driver, well. . . . Standard dual-zone automatic climate control uses separate and easy-to-use rotating dials to set temperatures. Buttons activate other climate functions. The test car was dressed up with optional leather seating surfaces, and leatherlike MB-Tex material on the top of the dash and doors. Only the upper part of the dashboard has a padded surface, but door panels have a better dispersal of soft-touch materials. Front seats have cushion extenders for added leg support. Personal-item storage is handled in front by a small glove box and a moderately sized covered console box that also houses auxiliary and USB ports. Pockets are found in all four doors, though they are much smaller in back. Front passengers have open cup holders in the console, while rear-seat riders can take advantage of cup holders that pop out of the front of the pull-down center armrest. 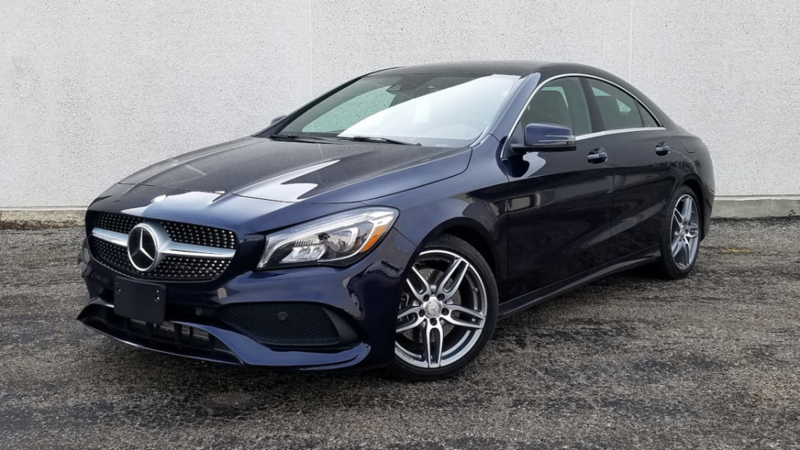 At $34,000, the CLA250 is a good basic car that happens to have a Mercedes-Benz star on the front. Aside from previously mentioned standard items, it comes with a single-disc CD player, memory-position power driver’s seat, keyless starting, driver-monitoring ATTENTION ASSIST, and a rearview camera. However, anything that smacks of true luxury—the kind that consumers assume when they see that 3-armed logo—costs extra on the CLA250. No, those earnest strivers we mentioned earlier won’t have to sign their names in blood to be able to swing this entry M-B, but they’ll still have to dig a little deeper to fully live the dream. The CLA’s rakish roofline makes for a sleek-looking profile, but it takes a real toll on rear-seat headroom. Written by: The Daily Drive staff on March 10, 2017.